I never cry in front of Eric. I try to be cheerful and joke around with him a lot. I don't complain to him about "life." I don't ever want him to feel guilty about being autistic or requiring extra help from me. He doesn't need yet another thing to worry about. 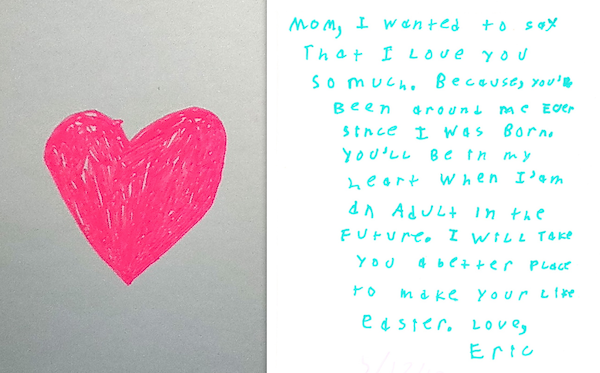 So to read the message in Eric's Mother's Day card yesterday was bitter sweet. Now I know that Eric knows things aren't always cheery with me and he wants to make things better for me one day. I am truly touched by the sincerity that is shared in this card. Beautiful!! Can I ask you a question? You know that children having autism have problem in concentrating over things, so how you deal with this? I mean I know a child suffering with autism and he is having problem in studies. He can't write because for learning how to write he needs to concentrate but he is unable to do that. If you can help? Thank you so much Somal Kayani! Yes, attention and focus has been a major issue with Eric. He continues to get better though. One major factor is probably just Eric becoming more mature --but I’ve pushed him along the way some. I try several things at the same time so it's hard to say which approach has helped him the most. I think a good starting point is to try and find something the child likes that can be educational and where the child needs to focus to get better at the activity. 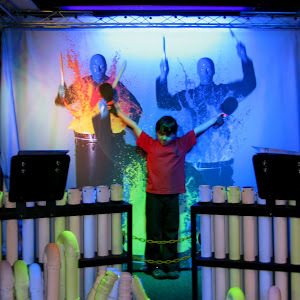 For example, Dance Central or Rock Band video games can be a bridge where a kid really likes the activity, but they have to maintain focus and effort to get better at it (Eric likes both of those). Then once they are used to maintaining focus on something like that, they can transfer that skill to something similar but more challenging. 1) I've read about the connection between learning/playing a musical instrument and improvement in academics. Eric takes guitar lessons now and he is able to stay on task for a solid 45 minutes without taking breaks, stimming, or being distracted. But, he is able to do that at his current age (14), and would not have been able to when he was 4 or 7 or even 10. The ability to focus has been a slow process, that has improved over time. 2) There is more and more credible scientific evidence being published about mindful meditation and how it helps in multiple areas of the brain including stress and focus. I haven't been as consistent with this but I think it does help Eric. I've seen him go from non-stop fidgeting during a 10-minute meditation to hearing him breathe steadily with few interruptions. Lots of room for improvement though. The other area that meditation seems to help Eric with is self-control which I believe is a key to being able to focus. 3) The last thing I will mention that I believe is helpful is getting Eric outdoors and exercising or playing sports. After a good work out he’s simply more alert and focuses better! When he was younger and his symptoms were more severe, we had a lot more help from professionals and Eric had daily/weekly therapy in OT/Speech etc., and I think those exercises helped him as well. I know all this can seem like too much. I hope one of these ideas can be of help.